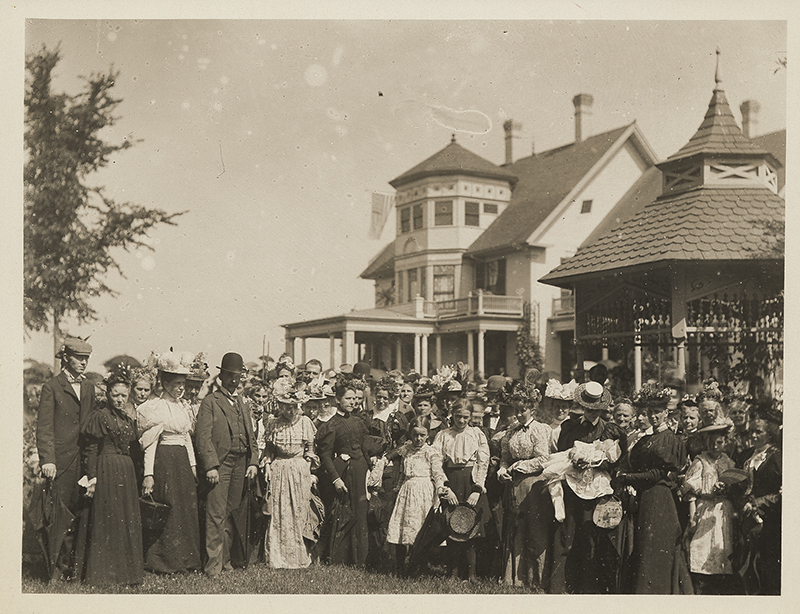 Visitors at Pleasant View, July 5, 1897. Longyear Museum collection. A curious anomaly exists within Mary Baker Eddy’s work Miscellaneous Writings: 1883-1896. True to its title, its contents include articles published within that date range — except for one: Mrs. Eddy’s Fourth of July address delivered at Pleasant View in 1897, a date that is clearly outside the time frame of collected materials. This 1897 date is not a misprint; several months after the publication of Miscellaneous Writings, Mrs. Eddy did host a memorable Independence Day celebration in which she and others addressed 2,500 Christian Scientists.1 Unique in its own right, this occasion set a precedent for future gatherings at Pleasant View, and in early 1898, the text of Mrs. Eddy’s address appeared in Miscellaneous Writings. The resulting anomaly in dates, whether unnoticed at the time or purposefully untouched, nevertheless remains today, pointing our gaze towards the subject at hand: the 1897 visit to Pleasant View, momentous for its precedent, participants, incidents, metaphysics — memorable indeed “in the annals of Christian Science.”2 And yet, for all its lasting import, the gathering came about quite spontaneously. A privileged few had known this announcement was coming, while others may have heard rumors, but to the majority of those seated in the pews that day, this was an unexpected yet extraordinary opportunity.5 Whatever plans there had been for the next day’s federal holiday, perhaps an Independence Day parade or even a return trip home, were forgotten or rescheduled.6 This was not to be missed. The historical evidence indicates that the event came together quickly. 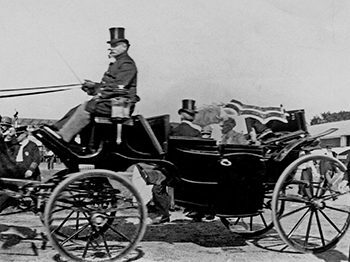 Having decided not to attend Communion, Mrs. Eddy must have recognized the opportunity afforded by two factors: the swell of Christian Scientists visiting Boston and the holiday on Monday.7 It gave just enough time for a trek to New Hampshire. In any case, the plans for the visit were set in motion less than a week before July 5. It was a hot day. On the shaded porch at Pleasant View, the mercury showed 102 degrees.11 There was lemonade available in front of the barn, and some people scooped water from the fountain with tin cups.12 But by all accounts, the crowd that had now gathered before the handsome home’s front façade was impressively unfazed.13 Including those from Boston, about 2,500 people were now waiting in the yard. In fact, the event essentially debuted several up-and-coming Christian Scientists, namely William P. McKenzie, George Tomkins, and Irving C.Tomlinson. There were other Scientists that spoke that day, such as Hanna, but they were already well established within the movement. These three, on the other hand, were relatively new, and owing to their promising potential, soon found themselves installed in significant Church positions. Their Pleasant View speeches, then, may be seen as the beginning of their Christian Science careers. 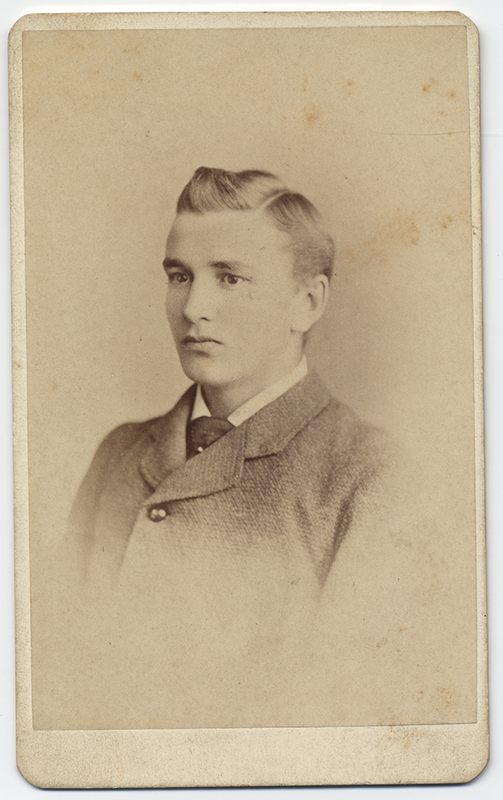 A young William P. McKenzie. Longyear Museum collection. Several months later, Mrs. Eddy wrote McKenzie and reiterated how impressed she was with his remarks.20 His proven devotion to the Church, coupled with his demonstrated ability to communicate clearly, marked him for a future within the movement. 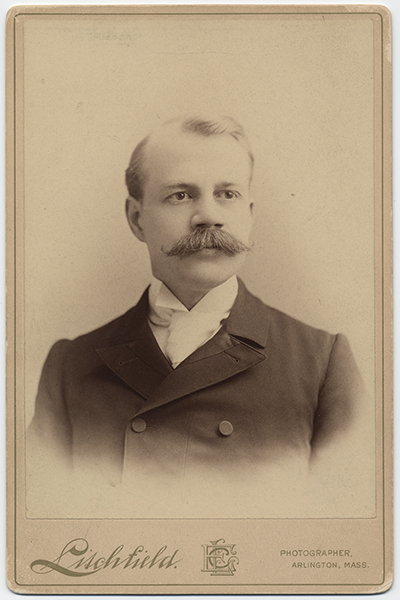 Less than a year later, McKenzie was named to the Board of Lectureship as one of its first five members, a post he would hold until 1915. 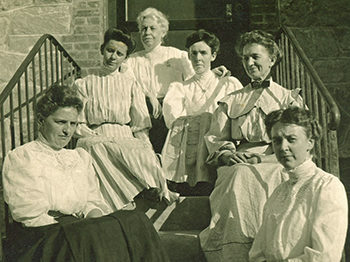 In May, Tomkins’s first article in The Christian Science Journal appeared: “What Made a Baptist Minister a Christian Scientist.”23 Mrs. Eddy wrote him, praising the article as excellent and calling its author a “light to those in the darkness.”24 She also expressed interest in a personal meeting at Pleasant View during the upcoming Communion season. With a purposeful zeal Tomkins left Pleasant View. His healing practice quickly flourished, which he detailed in correspondence with Mrs. Eddy. 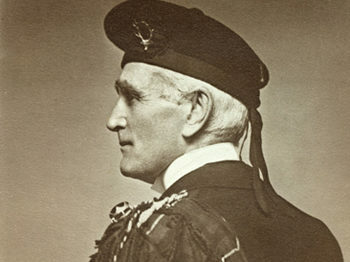 These promising reports, and his conduct upon the platform, must have distinguished Tomkins, leading to his appointment to the Board of Lectureship in 1898. This was a remarkable advancement, given it had been just one year since he first began his study of Christian Science. Irving C Tomlinson. Longyear Museum collection. The Universalist Preacher | To Irving C. Tomlinson, the visit to Pleasant View marked the beginning of a personal transformation in which he was ushered “into a new world.”28 The thirty-seven year old had close to a decade of preaching experience in Universalist churches, yet he still marveled at his opportunity to speak before Mrs. Eddy just a day after his admission to The Mother Church. 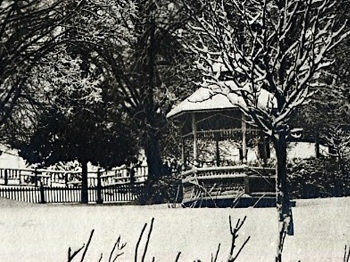 Tomlinson took Primary class instruction in 1896 from Flavia Knapp, and in 1897 it was through her that he received his special invitation to Pleasant View.29 It is unclear what exactly propelled him to Mrs. Eddy’s selection — perhaps his first article in the June Journal30 — but nevertheless, Tomlinson found himself invited to speak. Mrs. Eddy granted Tomlinson a brief interview after the program. To him, she radiated freedom, while to her he was a sign of hope for the Cause. 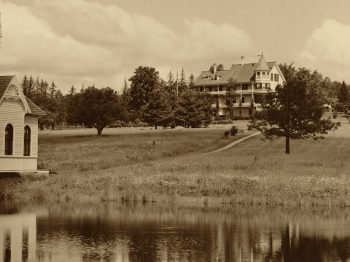 She recalled this impression in a letter to him: “From my first moments with you I have felt that you had come to help us and weighed in the balance would not be found wanting.”34 Like McKenzie and Tomkins, Tomlinson too was named to the Board of Lectureship in 1898, which was the first of many posts he would hold in a life dedicated to Christian Science. 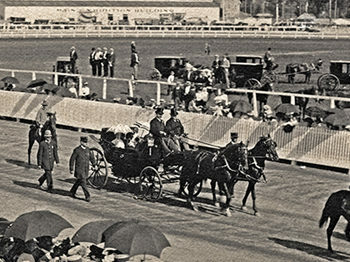 Mary Baker Eddy’s address from the platform was clearly the most prominent feature of the day’s program. Though all spoke well, it was for her that all had come, and it was her that they remembered most. The Boston Herald called Mrs. Eddy the “picture of health and energy,” while the Boston Globe noted her “straight as an arrow” posture, yet “delicate and tender” composure.35 Upon her dress of purple silk she wore a diamond cross and a ruby badge, the latter an ornament of the Daughters of the American Revolution. A bonnet over her silver-white hair completed the ensemble. Mrs. Eddy had two more accessories that apparently took some by surprise: a black fan in her hand and a pair of eyeglasses that hung from a gold pin on her dress.36 She used the fan from time to time, but the consensus was that Mrs. Eddy seemed least affected by the heat.37 As for the glasses, she did not use them. Significantly though, Mrs. Eddy did read her address from a manuscript, rather than speak extemporaneously.38 This reinforces the fact that she did not need her glasses on the occasion, but also highlights the interesting point that she had prepared her remarks. Polished and eloquently delivered, her address belied the quick turnaround time in which she had completed it. Writing to Hanna about its development, she confided, “I had such a fire as never before. So at the last moment prepared an article to read, a thing I have not [done] before in many years.”41 Indicated is a combination of pressures from an unspecified challenge and a shortage of time. Second May 22, 1897 Typewritten. Though the four documents share content similarities, the first and second documents were apparently not written with the Pleasant View occasion in mind. In a distinct shift, the third document introduces new content oriented for a public event. Furthermore, there are substantial differences between this third document and the final fourth version. Therefore, it can be concluded that while Mrs. Eddy had been developing some key ideas and phrases as early as May, it was not until just a few days before July 5 that she significantly revised and adapted this article for her address. This clarifies Mrs. Eddy’s comment regarding the last-moment nature of her speech, and it also reinforces the quick and spontaneous origin of the event itself. A slight stir was caused by one unfortunate incident. Edward Bates made a statement from the porch regarding some visitors from Kansas City, Missouri. This group had traveled by train for two days to be there, but Bates’s tactless comment essentially told them they had not been invited.45 Mrs. Eddy quickly rose and gracefully qualified his remark by adding that she was nonetheless grateful for their presence. She and others recognized the occasion’s significance, and care was taken to put it on record.49 In the Journal, a lengthy tribute detailed the experience, replacing the usual Communion review.50 Her address also found its way into Miscellaneous Writings, where it can still be read today. Its inclusion remains a curious anomaly with an extraordinary history, elevated by its spiritual message to posterity, and a worthy testament to that memorable Independence Day when a crowd of 2,500 gathered from all points to see and hear and meet Mary Baker Eddy. 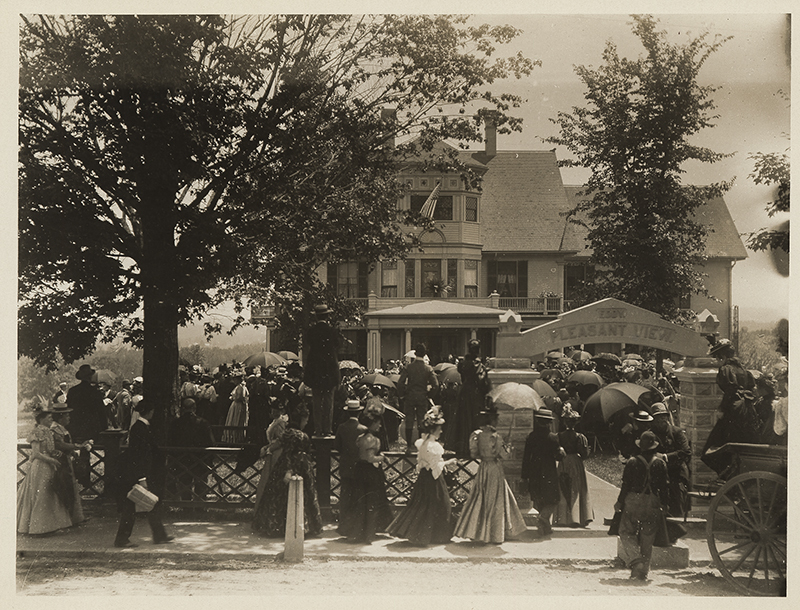 Visitors arriving at Pleasant View, July 5, 1897. Longyear Museum collection. Miscellaneous Writings was published on February 10, 1897. “Our Fourth of July,” The Christian Science Journal 15 (Aug 1897): 261. 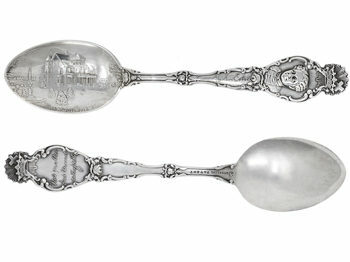 Clara M. Shannon notes Mrs. Eddy’s decision not to attend Communion (“Golden Memories,” 31, in Longyear Museum collection, Longyear Museum, Chestnut Hill, Massachusetts; hereafter referenced as LMC). Mary Baker Eddy, “Invitation to Concord, July 4, 1897,” in The First Church of Christ, Scientist, and Miscellany (Boston: The Trustees Under the Will of Mary Baker G. Eddy, 1913), 169. It is interesting to note that the invitation was published in Miscellany fifteen years after the address was published in Miscellaneous Writings. Mrs. Eddy asked Hanna to read the invitation twice at each service so that all would hear it; see n8. Regarding supposed rumors, details were apparently printed in newspapers before July 5. Also, Hanna sent information to the Boston Herald and Associated Press (Septimus J. Hanna to Mary Baker Eddy, July 3, 1897, in The Mary Baker Eddy Collection, The Mary Baker Eddy Library, Boston, Massachusetts; hereafter referenced as MBEL). Monday, July 5, was a federal holiday, since July 4 fell on a Sunday. At the 1897 Communion Service, attendance was possibly larger than usual given the switch from a quarterly to biannual observance. Mary Baker Eddy to Septimus J. Hanna, June 30, 1897, MBEL. Bates was well regarded for his role in the completion of The Mother Church building in 1894. Edward P. Bates, “Reminiscences of the Teachings and of the Personality of Rev. Mary Baker Eddy,” 70, LMC. Another 1,300 visitors joined the 1,200 from Boston. Some were from the region, others came from afar. “A Sultry Fourth,” Concord Evening Monitor; July 6, 1897, LMC. One hundred two degrees Fahrenheit is nearly 39°C. William Cooper reminiscences, 42, MBEL. Accounts and details drawn from “At ‘Mother’ Eddy’s,” Concord Evening Monitor, July 6, 1897, LMC; “Gathered from All Points,” Boston Herald, July 6, 1897, LMC; “Saw ‘Mother’ Eddy,” Boston Globe, July 6, 1897, LMC. Irving C. Tomlinson, “Mary Baker Eddy: The Woman and Revelator,” 174, LMC. Septimus J. Hanna to Mary Baker Eddy, July 3, 1897, MBEL. “Our Fourth of July,” Journal, 268. Mary Baker Eddy to William P. McKenzie, July 19 and August 27, 1897, MBEL. Tomkins had worked as a publisher and business owner. He had political connections to William Gladstone and religious connections to Charles Spurgeon (with whom Annie Knott also crossed paths in a meeting that nearly drove her to atheism prior to her study of Christian Science; see Christopher Tyner, Paths of Pioneer Christian Scientists, 94). Tomkins also was part of several publicized legal battles against his estranged wife, Elizabeth, and the Calvary Baptist Church in New York. George Tomkins, “What Made a Baptist Minister a Christian Scientist,” Journal 15 (May 1897): 80. Mary Baker Eddy to George H. Tomkins, June 17, 1897, MBEL. Tomkins recalls the request in the article “Aided Mrs. Eddy Popularize Her Creed,” LMC. The source and date are unknown, but it was likely published some years after 1897 in the New York Tribune. 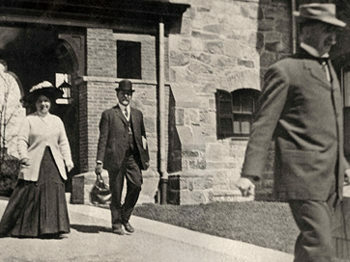 Tomkins contends that soon after meeting Mrs. Eddy, he suggested a number of ideas for publicizing Christian Science, including traveling lecturers, a weekly magazine, and a daily newspaper. See also George Tomkins to Mary Beecher Longyear, August 17, 1921, LMC. No evidence beyond Tomkins’s own assertions has come to light to confirm this. “Our Fourth of July,” Journal; “Saw ‘Mother’ Eddy,” Globe, LMC. George H. Tomkins to Mary Baker Eddy, June 12, 1897, MBEL. 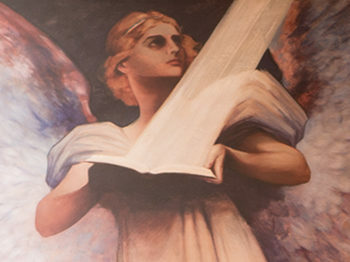 Tomlinson, “Mary Baker Eddy,” 165, LMC. Further details in this section are also drawn from the same. Calvin A. Frye to Flavia Knapp, July 1, 1897, MBEL. Irving C. Tomlinson, “The Religion of the Bible a Religion of Healing,” Journal 15 (June 1897): 136-39. Tomlinson, “Mary Baker Eddy,” 168, LMC. Mary Baker Eddy to Irving C. Tomlinson, October 29, 1897, MBEL. “Gathered from All Points,” Herald, LMC; “Saw ‘Mother’ Eddy,” Globe, LMC. Tomlinson, “Mary Baker Eddy,” 173, LMC. Regarding use of fan, see ibid; regarding heat effects, see “Gathered from All Points,” Herald, LMC, and “Saw ‘Mother’ Eddy,” Globe, LMC. “At ‘Mother’ Eddy’s,” Concord Monitor, L00174B, MBEL. Mrs. Eddy’s handwritten notations in the margins clarify that she read without glasses. Mary Baker Eddy, “Address on the Fourth of July at Pleasant View, Concord, N.H., before 2,500 Members of The Mother Church, 1897,” Miscellaneous Writings: 1883-1896, 251. Mary Baker Eddy to Septimus J. Hanna, July 6, 1897, MBEL. A10880, A10121, and A10122, MBEL; fourth version as published in “At ‘Mother’ Eddy’s,” Concord Monitor, LMC; “Gathered from All Points,” Herald, LMC; and, “Saw ‘Mother’ Eddy,” Globe, LMC. Tomlinson, “Mary Baker Eddy,” 174, LMC. Mary Baker Eddy to Joseph Eastaman, July 6, 1897, LMC. Mrs. Eddy wrote that it “pierced her heart” to tell her students not to shake her hand. William Cooper reminiscences, 39, MBEL. Jessie B. Cooper, “Experiencing Mrs. Eddy’s Love,” 2, MBEL. Ibid., 3. See also Irving C. Tomlinson, Twelve Years with Mary Baker Eddy, Amplified Edition (Boston: The Christian Science Publishing Society, 1996), 67-69. Mary Baker Eddy to Laura Lathrop, July 7, 1897, MBEL. Notations from William B. Johnson indicate that the text of the address, the invitation, and the Concord Evening Monitor article with Mrs. Eddy’s modifications (see n38) were entered into the record books of The Mother Church (Mary Baker Eddy to William B. Johnson, July 24, 1897, MBEL). “Our Fourth of July,” Journal, 261-273. This article was originally published in the 2013 Spring/Summer Report to Members.